Fortunately, I've only experienced sleep paralysis once. It was the most frightening thing that I ever experienced. I woke up from my sleep and I could not open up my eyes, move my body or speak. I was total paralyzed. I was awake, aware of the sounds around me and I could feel my husband roll over next to me, but no matter how hard I tried to force myself to move or speak, I couldn't. I remember trying, with all my might, and nothing happening. It was terrifying. It wasn't a bad dream. I was totally awake. I will never forget that terrifying feeling of being away but paralyzed. I remember panicking and thinking, "Why can't I move, why can't I speak?". I tried to scream to my husband, "Move me, wake me, shake me!". Nothing would come out of my mouth. It was almost like an out of body experience. Finally, after a few seconds, perhaps minutes, I was able to voice a whisper but without moving my mouth, so it sounded like the girl in the video below. The whisper was not loud enough to wake my husband, who I was pleading to for help. I eventually came out of the paralysis, and when I did, I felt terrified, confused and exhausted. That afternoon I researched the Internet and discovered that what I experienced, like millions of other people, was sleep paralysis. After researching it, reading others people's stories about it, and watching youtube videos on sleep paralysis, I feel very fortunate that I didn't experience some of the other common terrors associated with sleep paralysis, such as feeling clothes being torn off, visits by demons and terrifying hullucinations. Sleep paralysis is a feeling of being conscious but unable to move. 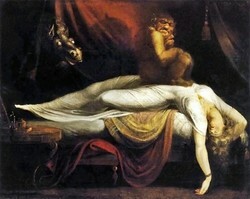 A sleep paralysis episode can last a few seconds to a few minutes. It usually occurs when falling asleep or when waking up. When sleep paralysis occurs when a person is falling asleep, the person remains awake while their body shuts down for REM (Rapid Eye Movement) sleep. When sleep paralysis occures when a person is waking up, the person becomes aware before the REM sleep is complete. Surveys suggest that 20-60% of people have experienced sleep paralysis at least once. It is common for people who have narcolepsy to experience sleep paralysis. Sleep paralysis is often accompanied Hypnagogic Hallucinations. Sleeping on the back (face upward). Sudden environmental and/or lifestyle changes. Have you ever experiences Sleep Paralysis? Old Hag (Newfoundland and some parts of the USA) For an old witch thought to sit on the chest of the paralyzed sleeper. Kokma (West Indies) For a ghost baby thought to sit on the paralyzed sleeper's chest and attack the troat. Gui Ya (China) For a ghost thought to sit on and assult the paralyzed sleeper. Karabasan (Turkey and in some islamic beliefs) For a demon thought to strangle the paralyzed person in their sleep. Kkana Tevoro (Fiji) For the paralyzed sleeper being eaten by a demon. Freightening! That explains why some people refer to it as night terror. Yes, I've experienced this half a dozen times. It is frightening. I've never heard of this - how frightening! At least now if it ever does happen to me I will think of this article and know I'll eventually be okay. Scary experience! It sounds fairly common, though, according to your report and the comments people have left here. I had this sporadically as a child for some reason. It's definitely a horrible experience. Yes, I've experienced this and you're right when you say it's the most terrifying experience and I don't think anyone can truly appreciate the sheer terror you feel unless they've experienced it themselves. This has never happened to me but did happen to my daughter last year. She called me very upset later. I had never heard of it until then. Will send this on to her to read.